Gum Trees ( Angophora and Eucalyptus, MYRTACEAE ). When ready to pupate, it attaches itself to a leaf or twig by the tail. 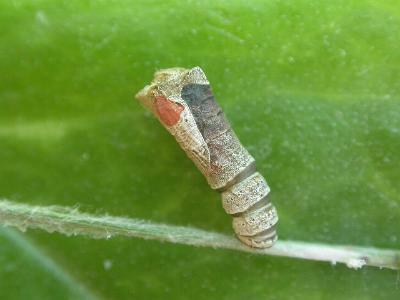 When formed: the pupa sticks out, unprotected by a cocoon. 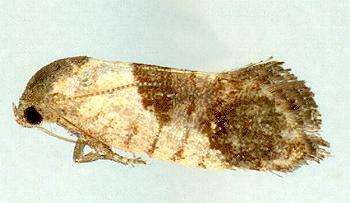 The adult moth has forewings that are buff in the basal half and black in the outer half. There are black ticks along the costa in the buff half, and a muddled buff patch halfway along the hind margin in the black half. 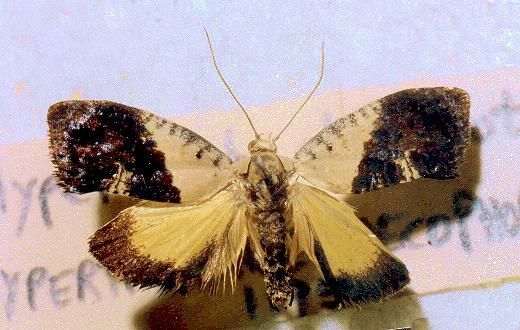 The hindwings are bright yellow with a black marginal area. The moth has a wingspan of about 2 cms. Series 2, Volume 1, Part 4 (1887), p. 1042.